For this week's podcast, we interview Anna Chodos, Assistant Professor in the Department of Medicine and Division of Geriatrics at UCSF, about her work in creating the Optimizing Aging Collaborative. The collaborative's goal is to enhance and unify care of older adults in the community by creating a unique partnerships between public, human service, and academic organizations. 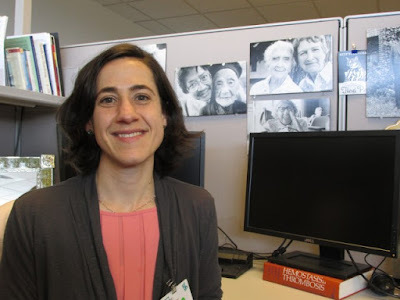 The Optimizing Aging Collaborative at UCSF, which was founded in July 2015 as a Geriatric Workforce Enhancement Program (GWEP) by the U.S. Health Resources and Services Administration (HRSA). The collaborative includes a broad array of experts to provide education and innovative services that address older adults’ health, social, and legal needs, that hopefully other cities can replicate. Alex: Today we have Anna Chodos who is Assistant Professor in the Department of Medicine and Division of Geriatrics here at UCSF. Welcome to the GeriPal Podcast, Anna. Anna: Thank you for having me. Eric: Before we start off every podcast we asked our special guest to give Alex a song to sing. What song is it today? Anna: It's Operator by Jim Croce. It's an oldie, but goodie. Eric: And I heard you're gonna sing, too? Alex and Anna sing “Operator“ by Jim Croce. Eric: Wonderful. So, Anna, we invited you to come on today to talk a little bit about what you're doing with something called the GWEP. Many of our listeners probably have never heard of that before. Eric: GWEP? How do you pronounce it? Anna: There is a linguistic divide in this country that some are GWEPers, some are GWEPers. Eric: Yeah, is it pretty polarized? Anna: It gets a little heated. The last national conference was a little rough. Eric: So what is the G-WEP/GWEP? Anna: We are a faction of this country brought together by a funding opportunity at HRSA to fund geriatricizing primary care and social services in this country to better serve older people. I think many of us may be more familiar with the idea of big G, little g geriatrics and this is really trying to hit hard on the little G geriatrics of getting geriatrics knowledge and skills into more people in the health care workforce. And, in this case, also the social service workforce, without necessarily only focusing on developing big G academic geriatrics or specialty geriatrics. Eric: And what you're doing is you're doing both. You're doing teaching here at the academic university, but what's really interesting is you're also bringing this out into the community and working with a lot of community partners to deliver primary geriatrics and primary palliative care teaching to them. Is that right? Anna: Yes, and other GWEPer, GWEPers will feel similarly that the call for this funding really incentivized people to do that, to be creative, to do integration between health care and community. And everybody's has looked different. There are 44 across the country, so many states have them, many cities have them, but it really incentivizes us to create reasons to work together, reasons to improve care for older people across those two service areas for older people. And the way it looked in our world, and I think probably ... I've not been here that long, but what I understand is that a lot of us have been working with community partners for a long time to try to improve care for older people or get more services for older people. That's just such a part of what we do and how we keep older people healthy and well in the community that there was a lot already there to build on. But the really wonderful thing about this particular program now is that that's what we're supposed to be doing is working together, meeting regularly, having shared goals, having shared vision and outcomes around improving care for older people. So we work with Alzheimer's Association. We work with other non-profits like here in San Francisco, Open House, which serves and runs programs and does housing for older people who identify as LGBTQ. We work with Homebridge, which is a training organization for caregivers, usually funded by in-home supportive services. And we work very closely with probably the biggest partner, which is Department of Aging and Adult Services, which is our triple A here in San Francisco, or the way most of our social services are coordinated for older people, especially low-income and vulnerable. The reason some of those partners are part of this particular program is the people we serve. Here in San Francisco we really wanted to make sure that any programing we were doing in any girding of our system and safety net for older people was gonna address the people that we have here and that's largely immigrant. Over half are three times the federal poverty level or below, which here is significant because it's a very high cost of living area. Of course, very notable and proud LGBTQ community. We also have about 30% of older adults who live alone. And then a big call within all the GWEPs was to try to focus on adults with dementia and related diseases, so we've done that as well, but that's certainly a natural focus for us. We know that those are vulnerable older people. Hence, partnerships with Alzheimer's Association, DAAS, and Open House. Eric: What do these partnerships actually look like? What does it mean to partner with someone? Anna: Lot of exciting emails. No. Really it means meeting, it means going to their organizations, it means talking openly about how can we both do things that will advance our shared goals. Should we look for funding together? Like, working together. Alex: Could you give an example? Anna: Yes. And then the other thing is, sorry, is, of course, we do a lot of trainings together. We actually work on developing the bread and butter of what we're doing and trying to build competency in working with older people is knowledge transfer or teaching. We can probably end up talking a lot about whether or not that's the only thing we need to do, but that's where we're starting for the most part. And so we're working a lot with, for example, Alzheimer's Association and us to train another partner organization. Sorry, we actually have so many that sometimes I forget to list them all. Little Brothers Friends of the Elderly, which is an international, or at least national organization that is a volunteer visiting program for isolated seniors. With them, Alzheimer's Association and us we sort of take turns and collaborate on training on topics, specifically more related to dementia and helping them work through a program that they're developing to address the needs of older adults living alone with dementia. Because that has previously been challenging, especially when people don't have the skills or feel intimidated, as it were, by working with older people with dementia, and they know that's a highly vulnerable group so they were really invested in learning more about dementia and how to work with people with dementia and develop a program within their own organization of being able to do more outreach to them. They have a name for this program, Elder Navigator. They're working with other faculty at UCSF. It's a big program with a lot of tentacles and we get to get in the mix and help do some of the education and competency and self-efficacy building around working with older adults, so that ultimately those older adults will get more connected. Eric: So there's a lot of talk in geriatrics and in palliative care about doing primary geriatrics or palliative care, which is often teaching primary care doctors and frontline health care professionals about how to deliver either one of those topics. Alex: Although I think there is a distinction there in that when we talk about primary care, palliative care, it's usually like the primary care physicians or the oncologists. It's still a layer of, for the most part, physician specialists we're training. Eric: Yes, and not community providers. Alex: And not community providers, so this is somewhat distinct. This is almost a different level. It's like there's tertiary, secondary, primary, palliative care, and then very like what is zero? Eric: Or maybe it goes to quaternary, like it's the top level. The thing that all of us should be trying to achieve or strive for is actually getting out of just this ivory tower, the physician's office, and into community partners 'cause they're the ones delivering the most amount of care. Anna: Well, the thing that we've heard a lot and is, to me, totally at once sort of mind blowing and inspiring is the people who are absolutely on the front lines. In our community we have a bunch of, oh boy, aging and disability resource centers and these are meant to be little community hubs that people can walk in and get hooked up to resources or learn about stuff. Not necessarily get enrolled and do a bunch of paperwork, but just get some information. And a lot of the absolutely front line people feel like they need more help knowing how to work with older people. Just the basics like how do I talk to somebody who constantly comes in and tells me she's worried that they're poisoning her water? What am I supposed to do about that? Who am I supposed to connect with? How should I be responding? Alex Can I ask a question? Alex: How should they be responding? Anna: Buy lots of bottled water and ... No! One thing is you need to know what the community mental health resources are. You need to be able to respond affectively and not necessarily to the content of a delusion. I know there's some skill there, but understanding that the person, if they weren't doing that the week before might actually be ill and reaching out to others to see, "Hey, maybe you should go see your doctor. Where is your doctor?" But just the basics of what's dementia and how is that different than normal aging. It's not normal aging. Some of these pretty basic concepts. How might a mental health disorder look differently? Eric: In an older adult. Anna: And then again, we're all constantly learning about new resources from each other and the partnership. Through meetings, through having discussions about new training needs that we've identified because we did a training and somebody came to us saying, "Oh, we'd love another training in x, y, z." Talking to partners and then finding out, oh, there's this other organization that works on training people on pulse forms or advanced directives. It's actually been really humbling to realize as a provider I do general primary care and geriatrics. I often feel alone, like why aren't I getting this person connected to services or even social workers who I work with constantly are having trouble. And then I talked to some of our partners and realized there was 10 other things we could have tried to connect that person to. So I've realized we actually are in a, particularly here in San Francisco, a resource-rich place. That's not necessarily our problem, but the connections aren't happening and sometimes some people aren't recognizing things like maybe elder abuse or self-neglect or early dementia and aren't connecting people early enough or helping out enough. 'Cause a lot of times people hand you a pamphlet and say, "Call this place to get a caregiver," and there's a missed connection and nobody ever figures out why and it's because they have undetected cognitive impairment or whatever it is. So I know I'm saying a lot of words, but I think generally the thing we're learning is that people want to serve older people really competently, really well, of course. Everybody who's gone into a social service field or a health care field has pride in the work that they do and wanna be doing a good job. But there's a lot of missed opportunity with older people not knowing what you don't know about very common things that affect older people and how you could connect them. It is less glamorous than richly physiologically describing or medically describing a geriatric syndrome, but a lot of this basics and social service resources is extremely helpful and we get a lot of great feedback from people when we're able to train them. Eric: We're probably not alone that we live in a city where there are these resources, but many of us, including myself, may not know what they all are. Do you have any hints or tips or tricks or lessons that you've learned over the course of the last couple years on how we can build those connections? Anna: I think one is, and we're certainly doing this now, is a bit of inventory. Spending some time learning what's out there. I think some cities have done a better job in terms of creating usable central resources and I know that that's in motion and that's by no means our work. But encouraging social workers ... So a lot of places aren't gonna have geriatric social workers. We don't. So encouraging them to learn a little bit more about key issues with older adults and that would be particularly caregiver services and eligibility. Things to keep them independent in the community because that's what matters to older people, or adult day health programs, and long-term care issues. That comes up a lot and you'll often get people saying, "Okay, well. We were thinking this weekend we would put her somewhere where she can be cared for better than we can care for her," and you're like, "Well, that's gonna be six more months." But encouraging people to learn ... I think people have to know what they don't know and know that they need to ask and learn. Of course, we like to show up and offer to do some teaching, too, and leave behind some resources. Alex: Yeah, some would say, "What are you, a doctor, doing, doing this? What isn't this the domain of social work?" What's your response to that? First of all, none of us have time to do all the things we're supposed to be doing in primary care and we all know that. So to add on, "I'm gonna counsel you now on caregiver educational strategies for dealing with dementia behaviors," which, at end of the day, is the most important thing you could do for that person and that family if there's dementia behaviors, is just not feasible and practical. But if you don't even know where to start, you're definitely missing an opportunity. I think you need to have at least a passing knowledge of some of these things 'cause it is the biggest issue facing that family and that patient, and the biggest thing you could do for that person's well-being is probably to address some of that stuff. Alex: But really why a doctor? Anna: Well, I'll give you an example. When I went to ... Not from my work, but from my personal life. When I went to my follow-up with my primary care physician, I followed up diligently for something that was no longer a problem so I basically sat down and told her that and she as like, "Okay, well, I guess we're done." And I agreed. She said, "So we have about 15 minutes. Could I ask you some questions?" And we literally reviewed two cases that she had coming up that afternoon of 90 year olds that she didn't know how to address. Not medical stuff, of course, social stuff. One, she wanted to talk about driving. Another one, she wanted to talk about safety at home. And this is why. She has 30 years of primary care experience on me, but this is the issue most affecting the care and well-being of her ... Well, maybe not most, but my assumption. But clearly affecting the well-being of her patients and she doesn't know how to manage it. So that's why I feel like the little G geriatrics, getting that into primary care, is definitely important, and for us that does include the social stuff for sure. Eric: It's interesting. We've got palliative care, we have primary, secondary, and tertiary. And geriatrics, we have big G, little G.
Anna: Yeah, it's a little simplified. Eric: That's great. The big G geriatrics being like the academic geriatrics for the most part. Eric: Yeah, it doesn't. No, but here's the other [inaudible 00:17:38] we're talking about. Is it G-WEP or GWEP? Is it palliative or pa(ae)lliative? I think the key there is if you're from the United States, it's palliative. And if you're from Canada, it's pa(ae)lliative. Eric: Like a pail. But I don't think that's a hard and fast rule. Alex: Yeah, maybe we should change this podcast to GeriPail. Eric: That's what we should do. Alex: For all you Canadians out there. Anna: Welcome to the GeriPail podcast! Eric: Wait, Anna, I have a question for you. You're getting funding to do this through GWEP? Eric: So what can you say to our listeners out there who are not getting funding to do this through GWEP? Alex: Aside from get funding. Eric: Right, aside from get funding. What would you say to those listeners? Anna: Yeah, and I'd also say that is the generous and wonderful nature of this project is that it has allowed for that because I know, historically, that has not been the case and probably a lot of the reason why some of this work wasn't done before, 'cause it's not like people didn't know it needed to be done or weren't hoping to get it done. One thing, actually, I'd recommend is all of the GWEPs, most of us have great websites. Okay, we're still working on ours. Www.optimizingaging.org. Eric: Oh, I like that. Alex: Do you know that you don't have to say the www anymore? Alex: Yeah, I'm still doing that, but the young kids, they don't do that anymore. Anna: Yeah, optimizingaging.org. Who engineered getting ... Anyway, I should look into the history of that. So a lot of us have great materials. Modules, like videos, handouts, ways to educate yourself. I think there's still an element of knowledge transfer that needs to happen. And then the other thing about the GWEPs that's been really interesting is they encourage a, they call rapid cycle quality improvement methodology to that work. In the areas where we are contributing to systems change to help formalize some of the knowledge and improved little G activities, we sort of try to rapidly, both implement a change, study it, and improve it. There's a lot of materials around how to do a screening in your clinic. How to incorporate a quick fall screen and then incorporate a nurse specialist in geriatrics to manage falls and positive cognitive screens, things like that. Already in our two years, so limited experience, working with three different primary care settings and, within that, very different clinics. Everybody's approach is different. There's no one solution for a primary care clinic because they're all so different, they all have different patient populations and they all have different workflows. So this is where, potentially, it gets a little dry for people to think about, but that's where the rubber meets the road. How are you gonna screen for cognitive impairment, in who, and how are you gonna track that, and then how are you gonna follow up on that, what does that look like? That's another big part of what we do. I think a lot of the GWEPs have a lot of those materials online and that's actually the focus of our last year is to develop train-the-trainer materials so that we can expand our reach a little bit and empower organizations and primary care settings to train somebody within and have materials and then to really beef up our website and materials that people can use. So all of this is the federal government funded us to do it so we want people to have it. Eric: I wanna back up a sec. Did you say we should be screening for cognitive impairment in primary care? Anna: I did not say that. However, some places wanna do it and I salute them because I think it's a wonderful idea. I will say that that is actually one of our projects is not working with primary care, working with the community. Our Department of Aging and Adult Services and their in-home supportive services division, which is the caregiver division, so you have to have a functional impairment to get a caregiver, is gonna be screening everybody for cognitive impairment. So one of our parts of our program was to help work with that idea and figure out how you could do that. How you could get that information through their system appropriately and have appropriate quality control and further evaluation as needed within their own organization and then feed that back to primary care, which is their goal. They felt really strongly that they wanted to see this better addressed and I think that's amazing because that's really gonna ... If we can reach those primary care doctors, which is part of our role to help them think through that and hopefully do it well, how are they gonna respond to that information? Eric: Has that rolled out yet? Anna: No. It's rolling out the beginning of the next calendar year, but it's pretty amazing, especially considering they have 22,000 clients. Alex: Aging and Adult Services? Anna: Yeah, and the in-home supportive services, yeah. Alex: And all 22,000 will have cognitive screenings? Anna: That's kind of the ideal, like they have a regular intake. However, obviously, I learned that you're not supposed to screen people who already have something, so things like that we won't need to screen people. Alex: Right, right. If they already have dementia, then there's no need to screen them. Anna: Presumably. Although, it's not ... The whole point is probably a lot of those people are undiagnosed. Alex: That's probably a better target population where screening might make sense rather than a general primary care population because Aging Adult Services sees people who are highly likely to have cognitive impairment. But then the other tricky thing is then is there something you can do about it? What will the primary care doctor, once they know their patient has cognitive impairment, what will they do? How will that influence them? And then can you give them the ... What should they do? Anna: Well, then the thing I hear from primary care is, "We don't have anywhere to send them. We don't have time to do an evaluation. We can't do anything about cognitive impairment anyway." So it depends on the setting. For some of them, we have developed like, here's how you work out cognitive impairment in our system. So not a theoretical, up to date article, but in here's who you might ... Like, click on this button to order this lab, like a very specific algorithm. Here's who you might refer. And then someone like me is very interested in using that information to advocate for more resources to address cognitive impairment and make a, as comprehensive as we can, care plan. 'Cause I personally don't agree that you can't do anything about it. Eric: Are there one or two most salient lessons that you've learned over the course of the last two years of bringing little G out there in the community? Anna: Yes. In our short time, we have had a tremendous experience. First of all, realizing how grateful people are for some knowledge addressing these topics, that they're really under-addressed. And how eager people are to be incredibly competent and good at what they do, so it's really well-received. And we have definitely, almost at every point, identified more need. I think we certainly have that feeling, who knows how far it will go, but of a tip of the iceberg kind of feeling of the need for this kind of knowledge and competency building. And then the other lesson, clearly for us, has been the joys of partnering with people who are so committed to making sure older people have joy and dignity in their lives no matter where they are, no matter who they are, no matter what resources they have. So working with all of our amazing partners like Little Brothers, Homebridge, DAAS, UC Hastings that help us do medical legal practice work, Alzheimer's Association of course, social work schools, our nursing schools here. So on the academic side, everybody. From the partnership side, we are just starting to evaluate that and asking people. They say that even in a field that they've worked for a really long time, the fact that we're all partnering together in this effort has opened more doors for them. And I think I'm more and more convinced that there really isn't enough resources to build the big G and that the little G is very much worth our time. Eric: So what's next for GWEP? Anna: Correct. But, yeah, his budget was not friendly to this idea of continuing to fund such programs so we are obviously carefully watching and advocating for ongoing funding for stuff like this. But for us, really, personally, as a program, our next is how far out should we be going. So if you look at other societies, communities that have other values and other organizational structures. Japan, Singapore, even frankly places like Utah where there's this tight social structure. There's a lot more lay people involved in detecting and addressing issues with older people and their idea of what you need to be a competent society to, again, bring joy and dignity to the lives of older people in their every day is bank tellers need to know what's going on because they make mistakes at the bank. Post office guys need to know what's going on because they're the ones who actually see older, isolated people. There's a lot of amazing lessons to be learned there and I'm certainly passionate about that kind of work and how much I convince people who fund academic geriatricians to be doing that kind of stuff is really fascinating to us. And you guys think about the primary, secondary, tertiary, and I think we think of more of a nesting dolls concept of how many rings out are we gonna go in touching our community, making sure they're competent. And probably the farthest out we've gone, and in collaborating with Brie Williams and her amazing work, is with our police department here in the city because they respond to a lot of crises with older people and making sure they know that there's certain considerations, like behavioral disturbance and dementia, that aren't criminal activity. Working with them in the context of a crisis intervention course and doing trainings was something that Brie Williams started, who's very involved in criminal justice. That's as far out as we've gone other than we do do ... I just came from a talk at a community center with older people, just talking with an older woman's health group. So that's, obviously, really important, too, to empower people and their caregivers and family, but we love to think really broadly and build more partnerships. Eric: So how about we end with a little bit more of the song.